“Happy, happy, happy ! I’m oh so happy, “ she sang as she skipped along the footpath. Suddenly, she stopped. Looking carefully down at the cracks between the pavers, she stooped to delicately pick something up with the fingers of one hand. She then transferred whatever it was into the palm of her other hand. Examining it closely, she was totally absorbed in the moment. Having completed her examination, she once again stooped to gently put ‘the thing’ back down. Only this time she placed it in the shrub growing on the verge. Then she was off again, skipping and singing. “Oh, that’s just silly!! I KNOW what it is. It’s my toys,” she said, vigorously nodding her head. And so the guessing game continued between the ridiculous and the real. I found myself caught up in the excitement and make-believe of the moment. It felt like I had reverted back to my childhood. Her father’s voice calling for her jerked me back to reality. I walked over to the fence, introduced myself and welcomed him and his family to the neighbourhood, saying I had been delighted with the company of their daughter. He apologised profusely, saying he hoped she had not been too much of a nuisance. I reassured him it was quite the opposite. The pleasure of her company was something I looked forward to sharing many times in the future. Staring at me in confusion, he said it was time for her to come home for dinner. I nodded and returned to my seat. Melanie looked at me solemnly as she asked “Is he mad? He warned me not to be a nuisance. I just got so bored.” I reassured her he was not angry. He just wanted her to go home for dinner now. I thanked her for her company and said I hoped we could meet again soon. She looked at me with solemn eyes, nodded, and went home. I was left with a slightly uneasy feeling which I could not identify. It was to be many days before I next set eyes on my new neighbours. There had been a parade of removalist vans over the first week. The two story house must be full to bursting, I thought. I heard little of the activity that must be taking place in the house itself during this time. Neither did I see anyone other than the delivery men. This did not strike me as particularly unusual given that they were busy settling into a new home. With that her mother stopped to look at me and smiled. She looked tired. We chatted for a while. Conversation turned to the inevitable questions of how they were settling in to the new neighbourhood. Shrugging her shoulders, she told me there a few minor hiccups to be sorted, such as leaky kitchen plumbing. They were having difficulty finding someone to come and fix it. I asked if she would like the name and number of a plumber I used. He was very reliable, a good tradesman, and reasonably priced. Gratefully she accepted the offer. We parted company with me promising to drop off the business card later in the day. Having finished my shopping and some other essential errands, I returned home. Unpacking and putting it away did not take long. After all, I only shopped for myself and did not like to keep excessive stock of anything in the house. Being retired I found it best that way as I often went away on mini holidays. I kept my home utilitarian and minimalist. What I had was the best in quality and taste. My home was set up so it required little maintenance. All of which I organised to be done whilst I was away. For me it was pragmatic simply for the convenience of being able to pick up and go away on a sudden whim without undue stress. In this respect I guess my lifestyle was self-indulgent. My circle of friends came from all walks of life. They were scattered across the globe, as was my family. I liked to catch up with those closest to me regularly without overstaying my welcome. Finances were never a concern for I had more than enough for my lifetime of needs regardless of how much I spent. I loved travel. My visits often coincided with travel to places on my bucket list which was extensive. Reflecting on this as I searched for the plumber’s business card, it occurred to me that I had stayed home an unusually long time. Perhaps I’ll make my next trip a longer one. This time, I thought, I would not visit anyone. I would just travel for the fun of going to places. Yes, I decided, I would start planning it this very day. Card in hand, I walked over to the neighbour’s house. As I got closer I could hear screaming, and yelling, and banging. Not sure that this was the best time to intrude, I turned around to go back home only to be confronted by the sight of Melanie curled up in a foetal position under a bush by the steps. Oblivious to my presence, she hugged herself and whimpered. Undecided as to what to do, I stood still for a moment to contemplate the best course of action. Obviously there was some sort of domestic disturbance in progress. And it distressed Melanie so much she had come outside to hide under a bush. I did not know whether to go back home and pretend I had not noticed Melanie or to stop and console her. The decision was taken out of my hands. I heard the front door open. Melanie’s father rushed out frantically calling for his daughter. “Mel !!! Where are you, baby? Mum and I found your favourite doll. Look, here it is,” he said holding the doll in one hand. Melanie stopped whimpering and rushed up, clutching the doll to her bosom. It was only at this stage that both of them noticed me standing there. After a slightly awkward pause, I said how good it was that the favourite doll was not lost after all. I still remember how sad I was when I lost mine, I added for good measure. Smiling, I handed her father the business card explaining that I had promised to drop it around. I bid them both good night and made my way back home. The incident left me rattled. I wasn’t sure why. Somehow I felt all may not be well with the family next door. There was nothing to be done about it of course. It was none of my business, I thought, unless…….It was the unless that unravelled me. Memories of my own childhood came flooding back. The lost doll incident was true. It had been the last in a long build up of domestic violence and sexual abuse at the hands of my alcoholic father. He had destroyed my most prized possession and comfort in front of my eyes. This he did in a most cruel and realistic simulation of the abuse he subjected all of us to many times. My family was torn apart because of the violence. Divorce saw my mother trying to raise the three of us on her own. Work was scarce. She turned to prostitution. Often, we found her drunk and in bed with strange men. Many of them abused her in every possible way. The inevitable happened of course. She was found dead in bed by my older brother. Cause of death cited on her death certificate was ‘overdose on amphetamines’. It was unusual in those days, but not unheard of. My father had died of ruptured oesophageal varices some years earlier. As there were no relatives or friends to take over our care we were placed in an orphanage. Too old to adopt, years of living in a series of foster homes followed. Not once were we placed together. Although I moved many times to different homes, I was fortunate to be placed in homes that provided me more stability and nurturing than I had ever had with my natural family. Needless to say I lost touch with my siblings. Even later in life when we did reconnect it was awkward. These days we exchange token Christmas and birthday cards if we remember. It has been many years since I actually met them and their families. I know very little about their lives now. As soon as I was old enough I struck out on my own. Having an eidetic memory served me well. Despite my childhood tragedies, I excelled at school. Learning was my escape and my passion. I immersed myself in books. Early on I discovered I had a passion for insects of all shapes and sizes. This eventually led me to a career in entomology. I became a highly respected international expert on insects of all kinds. Meticulous with my research, I drilled down to a level not explored before. This led to my work being published. To this day it is considered one of the best resources of its kind. As my work became better known, I was sought after as a consultant on projects for natural pest control and eco-culture. It was through my work that I also met and eventually married my husband. He too was a researcher in the same field. We made a formidable team. Unable to have children due to the internal physical trauma I had suffered as a child, we immersed ourselves in our work. Field trips, grants, consultancy work led us to many exciting places across the world. It more than compensated for what others perceived as ‘lack’ in our life. We did not experience it as lack at all. Quite the opposite. We were free and unencumbered by responsibilities and duties. I still deeply miss my husband. He died over ten years ago. My personal passion is the Coccinellidae, commonly known as ladybirds. As a child I was fascinated by them. I would roam fields, parks and gardens looking for them. I was delighted to find there were so many different kinds and sizes of them. And not just that. They seemed to have an affinity with me. All I needed to do was gently place my hand next to one and it would climb on to my finger. I retained my childhood fascination as an adult. Many years of research made me a Coccinellidae expert. 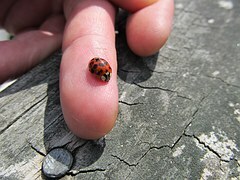 I became known as “The Ladybird Lady”. My home and garden was turned into a ladybird paradise. I had created the perfect environment for them. As the move to more natural management of plants and crops grew, I found myself setting up a business to breed them in commercial quantities. It continues to thrive and is one of the major sources of my income. Most people now know that one of the good things about ladybirds is their taste for aphids as a food source. As I wound down my work to lead a more genteel and leisurely life, I found myself increasingly drawn to learn more about ladybirds. I delved into children’s rhymes, folklore and mythology across cultures as well as the more esoteric, metaphysical aspects and symbology. Currently, I am in the process of putting it all together into a book. A personal indulgence, my publisher has persuaded me to include some of my drawings, poetry and stories I have written about ladybirds over the years. Reminiscing had taken me down many paths of my life as I sat at supper that evening. I realised with a jolt what my discomfort and unease about the neighbours was about. It had triggered some deeply buried memories. The doll incident and seeing Melanie stoop and pick up a ladybird as she was skipping and singing had helped me to release these old wounds and cleanse my psyche. Gratefully, I acknowledged this and sent her and her family a prayer of thanks. Then I set about planning my first ever self-indulgent holiday. I intended to tick off a lot of items on my bucket list. What a deep, well composed, story. So pleased it is fiction. A very well written story. It cut a little close to the bone right down to the ladybugs. I hope it is based on fiction for you. This story is totally convincing. If I didn’t know better I would have believed it was autobiographical. It’s beautifully written! Yes, very well written, Raili. It’s good to be able to clear those hidden monsters whenever possible. I’m glad you didn’t intervene in the story. Not that someone shouldn’t have, but it would have change all your misgivings had you done so. Very dramatic. Goodness me! This reads so well and I wasn’t sure this was fiction for a minute. You and a few others 🙂 That delights me ! I thought it was real! Opher – I’ve missed you 🙂 I’m that good, huh !!! What a wonderful story! I am trying to catch up with all the posts that have been sitting in my mailbox and I’m so glad I didn’t simply delete this one. Ladybirds (or ladybugs as we call them here) are special to me, so I suspect that the title made me curious enough to read it. I’m glad this story is fictional, but the sad truth is that there is far too much of such abuse in real life, a fact I can testify to myself.